If you read our articles carefully, then, I’m sure, you’ve already seen our post about V-neck shirts, blouses and tops. 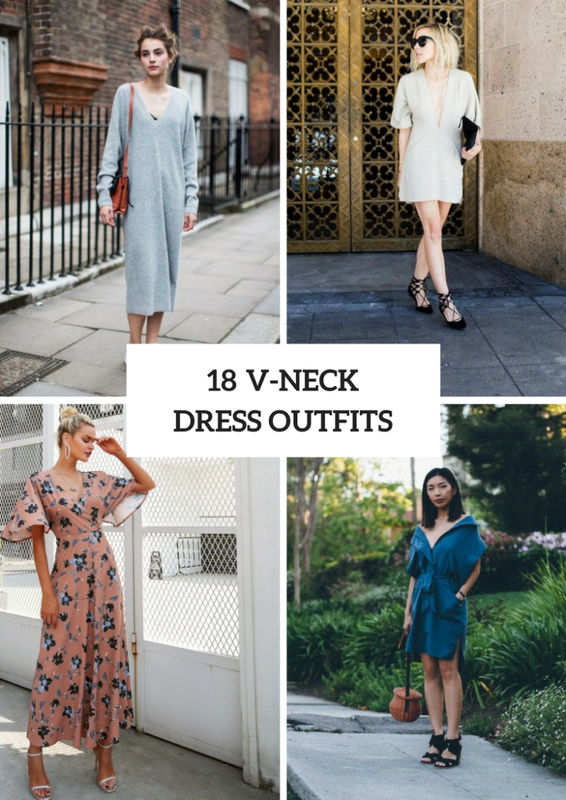 So today we want to continue this topic and share with you some elegant and feminine V-neck dress ideas. From my point of view, this type of dress is classic and common among ladies, so maybe you should try it too? You can choose any colors and prints you want. Moreover, you can also find dresses with various decor elements such as a fringe, ruffles, bows, etc. Now let’s look below and find a perfect outfit idea for this summer! If you’re looking for everyday outfit ideas, then you can find a black loose midi dress and combine it with white sneakers, a black leather bag and sunglasses. Or you can take a gray knee-length t-shirt dress, white and pale pink sneakers, a white jacket and a beige leather bag. If you want a more elegant look, then mix a light gray deep v-neck mini dress with black lace up flats, sunglasses and a black leather clutch. For creating a vacation outfit you should take a two colored maxi dress with a belt, a light brown wide brim hat and flat shoes. 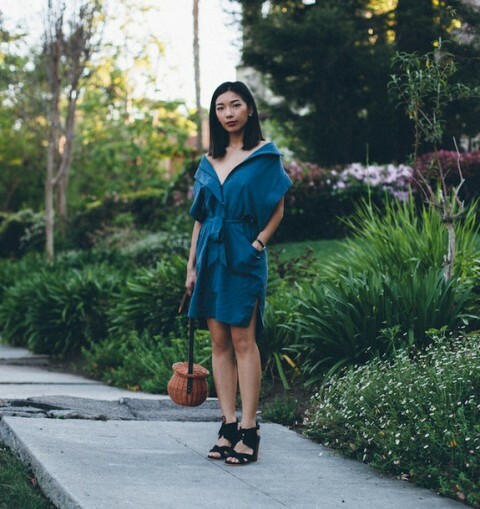 If you love original and trendy combinations, then pair a teal belted V-neck mini dress with a basket bag and black ankle strap sandals. Or you can take a yellow maxi dress with an open back and combine it with black platform sandals. Wanna create a cocktail party outfit? Then pay your attention to a red off the shoulder V-neck midi dress, rounded sunglasses, beige patent leather pumps and a marsala clutch. Or choose a pale pink ruffled dress and mix it with gray socks, black heeled shoes and a black clutch.